As promised, here are pictures of the antique harvest table we picked up at auction last week. Our first meal around the table was celebrating my Mum's birthday. A perfect first memory. It looks gorgeous! Hope your mom enjoyed her birthday dinner...everything looks so pretty. It's gorgeous!!! You must be so pleased! What a great find Tessa - worth the wait!! Just gorgeous -- the patina is beautiful. And, it looks like it has always been in your home. Also, I love the table you set for your mother's birthday dinner. Loving your new/old table! Such a sweet history with the writing indented! Your room is just gorgeous! Gorgeous!!! How wonderful to have your Mum's birthday celebration be your first memory around your new table! Beautiful table setting for her party too! Love the spring flowers with the blue and white...so elegant! I love that a child in the past wrote to their dear Mummy at Christmas on the table, and now you have the table and celebrated with your Mum...it was meant to be your table! just the kind of table I hope to have one day, once we have a space to hold a table of that size. I love it! it all looks so pretty and special! BEAUTIFUL!!!.... both the table, and the first memories gathered around it!!!! I would love to join you at an auctions. You find such interesting item the fit so well into your lovely home. THAT is one gorgeous table. I would hate giving it up from the dining room to put in the study... especially love the drawer on the end. I am hoping my husband will build me a pine farmtable with drawers in the end one day (he is reeeealllll slow at projects.) Then I will get to move my mahogany double pedestal table to an office for me! By the way, your chocolate cupcakes look delicious!! 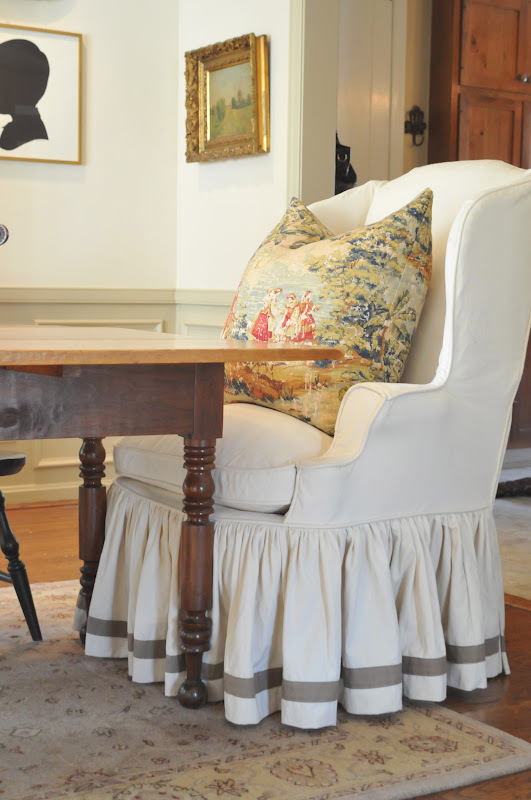 Love farm tables and yours looks gorgeous in your dining room. Thanks for sharing. May you have many memorable times in your cozy dining room. Love your antique farm table. Your birthday celebration is so beautiful. Did you make those lovely cupcakes??? Such a beautiful table. You really can see why older pieces are so special and have amazing wood. You'll love it forever. Looks like a lovely dinner for your mom. I like the tulips and hyacinths with your blue pottery! So, so pretty! What a great way to "break it in" with a birthday celebration for your Mom. So lovely! It fits into your home so beautifully! I would've bought it just for those drawers on the ends. Love it! Great purchase! Love your pillows in the Bosporus, I have the same fabric and colorway for my kitchen curtains that frame my french doors and have chair covers for my dining room. I have had it for many years and still love it...It is timeless! Love the pics of your home, am needing some inspiration for rearranging in my DR! Such a lovely home...Love the rug in the dining room.... where did you find it? thank you!! the rug is very old, but it came from Home Goods. Their wool rugs hold up incredibly well and their prices are reasonable too! I love the table, chairs and tapestry pillows. Where did you find the pillows? Also, when you say you purchased rug at Home Goods, as in Marshall's Home Gooods, or another store we may shop online! Where did you find your slip covered wingbacks? did you make the slip covers? tutorial??? ?